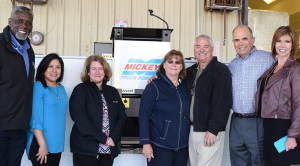 Mickey Truck Bodies is a company that likes to reward its team members. They’re rewarded for safety, for quality and workmanship, for tenure, for ideas and even for showing up for work every day. They celebrate their achievements with free luncheons, barbeques and biscuit breakfasts, all with plenty of trimmings. United Way High Point officials Joe Barnes (left) and Jane Liebscher (right) flank Mickey teammates Margie Richardson, Dana Layne, Gail Wells, Carl Mickey and Dean Sink at 2018 wrap-up celebration. But at Mickey, generosity is a 2-way street. The Mickey team’s benevolence is reflected most notably though its long-standing partnership with the United Way of Greater High Point. Over the past 5 years – from 2013 to 2017 – Mickey workers have contributed more than $609,000, including the company match, to United Way through payroll deductions. The total has increased every year-over-year, and during each of the 5 years there was a 100% participation rate among the Mickey team in High Point, which numbers about 350 strong. Earlier this year Mickey Truck Bodies received The Spirit of North Carolina Award for Campaign Excellence from the United Way of North Carolina. The prestigious award recognizes outstanding companies and their employees that demonstrate campaign excellence and community commitment through local United Way involvement. Only 33 companies across North Carolina received this award based on volunteerism, employee participation and giving levels, year-round education, corporate support, incentive programs and campaign rallies, among other criteria. 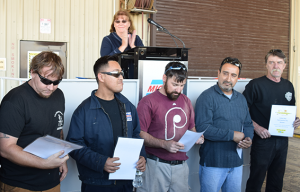 Gail Wells applauds 5 Mickey raffle winners of #1 – 5 winners of paid vacation day: Kevin Schenck, Israel Rojas, Joseph Daniels, Francisco Solis, Mark Crabtree. In February of this year, a team of Mickey representatives presented at a “Best Practices Show & Tell” sponsored by the United Way of North Carolina designed to share successful fundraising ideas with other corporate participants. Mickey Truck Bodies has achieved the status as a United Way Pacesetter – a community leader charged with “jumpstarting” the traditional fall campaign during the summer months and “setting the stage for other businesses in the community,” according to Gail Wells, VP of Employee & Community Affairs at Mickey and the company’s chief architect and head cheerleader of the United Way effort. The Mickey team also participates in the United Way Food Drive every year and, in addition, initiates its own programs to support families impacted by natural disasters. For instance, last December, following another banner year in support of the United Way of Greater High Point in which the company raised about $130,000, Mickey employees took it upon themselves to hold a Christmas Toy Drive to collect and distribute toys to families hit hard by Hurricane Matthew. “Coming together to support the United Way has strengthened our level of teamwork and helped us become better at attaining our corporate and personal goals. It’s been a win-win-win for everybody,” says Gail.